We, the undersigned elected officials of California, are deeply concerned about the impacts of climate change and pollution caused by the extraction, processing, and burning of fossil fuels on the people we represent. We applaud your leadership in affirming our state’s commitment to the Paris Agreement and in supporting groundbreaking policies like the Clean Energy and Pollution Reduction Act. Yet, these measures have failed to address fossil fuel production, the core culprit of climate change and a major source of life-threatening pollution. On behalf of our communities, and the estimated 5.4 million Californians who live within a mile of one or more oil and gas wells, we ask you to take the next step in bold climate leadership: phase out fossil fuel production in California by ending the issuance of permits for new fossil fuel projects, instituting a 2,500-foot public health setback for oil and gas facilities, and committing the state to 100% renewable energy. The science is clear: these actions are imperative to address climate change and to protect public health. Production of oil and gas is a significant contributor to California’s greenhouse gas emissions, and is particularly polluting. Three-quarters of California’s oil production is as dirty as Canada’s tar sands crude for the climate. We can no longer ignore the true costs of oil and gas production. The disastrous impacts of fossil fuel use, including air pollution, droughts, fires, mudslides, storms, and sea level rise, already cost Californians more than 12,000 lives and one hundred billion dollars annually. Yet the oil and gas industry contributes less than 0.3 percent of California’s GDP and a small number of jobs. 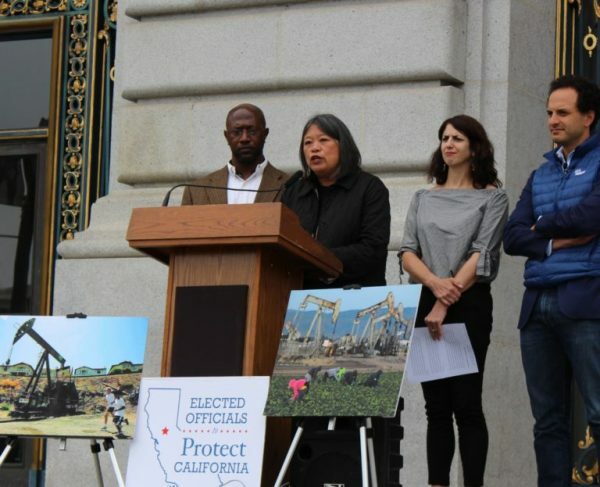 Scientific evidence demonstrates that exposure to toxic air contaminants and other pollution caused by oil and gas wells is a significant threat to public health, and disproportionately affects disadvantaged communities and people of color. According to the California Council on Science and Technology, the greatest health risks occur within one-half mile from active oil and gas development, yet nearly 8,500 active California oil and gas wells are within 2,500 feet of homes, schools, and hospitals. Unconscionably, California has no statewide policy limiting the proximity of oil and gas wells to homes and vulnerable areas like schools, parks, and hospitals. End the issuance of permits for new fossil fuel projects, including permits for new oil and gas wells, infrastructure for fossil fuels, and petrochemical projects in California. Design a swift, managed decline of all fossil fuel production, starting with a 2,500-foot human health buffer zone around all occupied structures, public parks and farms to protect public health and vulnerable communities. Commit the state to 100% clean, renewable energy, starting with significant investments in disadvantaged communities and areas that are already suffering the most from the negative impacts of fossil fuel extraction. This is the bold climate leadership we urgently need to protect our public health, communities, economies, and our future. Phasing out fossil fuel production is paramount to address climate change, and will make California healthier and cleaner while reducing water use. It will also create hundreds of thousands of jobs throughout the state as we increase investment in renewable energy, clean vehicles and buildings, energy efficiency, public transportation, and other innovative solutions. For a safe, healthy, and prosperous California, the time for transformative action is now. Respectfully, more than 240 elected officials from 34 counties in California. View full letter and signatories here.